The hot days of summer bring on lots of water play at our house. And beyond the sprinkler and waterslide, we love water balloon games. The surprise of the break in combination with an instant soaking speaks to the unique beauty of summer fun! For today's Endless Summer Projects, we're sharing 6 water balloon games that we love. The first (and sometimes most difficult task) of a good water balloon game is having lots of water balloons at your disposal. This game is for the older kids/adults in your group. It's a race to see how many balloons you can fill up and tie off in a set amount of time. Be careful, you're likely to spray yourself and others as you attempt to knot balloon ends and find the ones that leak and explode! This game is a great way to kick off the balloon festivities because it gets everyone a little wet and laughing at themselves and each other. Make sure you have a secure location, like a bucket or baby pool to hold all the completed balloons. A twist on the traditional pinata game with the prize being a great splash! Fill a handful of balloons and tie them together with string strong enough to hold the weight of the full balloons. Find a great location to hang the pinata for the various gamers to reach. Perhaps a tree limb, a playset, or a gardening tool might work well. Be ready for a few sets of swings to make sure all the balloons have burst! Of course, you can do the traditional balloon toss back and forth, moving one pace further with each successful catch. But we like to get everyone involved and take it to a different level. Have someone hold a hula hoop and have two team members work together to toss the balloon through the hole to their partner on the other side. Be careful, that hoop might cause a quick break in a balloon! This is a take on the outdoor egg race game. If you have small water balloons like we do, find large serving spoons to balance them upon. Some of our balloons broke before we even got the race started, so if you're a fierce competitor, use both hands to keep your balloon steady until the GO! signal is made. Determine how far you want your race to go (and if you want to lap back to the start line), and go as fast as you can. The object is to make sure you finish the race with your balloon balanced and in tact on your spoon - and you can use only one hand. If your balloon falls off, you have to go back to the starting line. If your balloon breaks, you're out of the game! Lay out a tarp or vinyl tablecloth on the ground. Sprinkle baking soda on top of it. Fill balloons with a mixture of vinegar and water. Watch the explosion! This one is all about who can make the best effect. Consider making small piles of baking soda on the cloth so that participants have something to aim for. This one is a great science experiment brought to life! 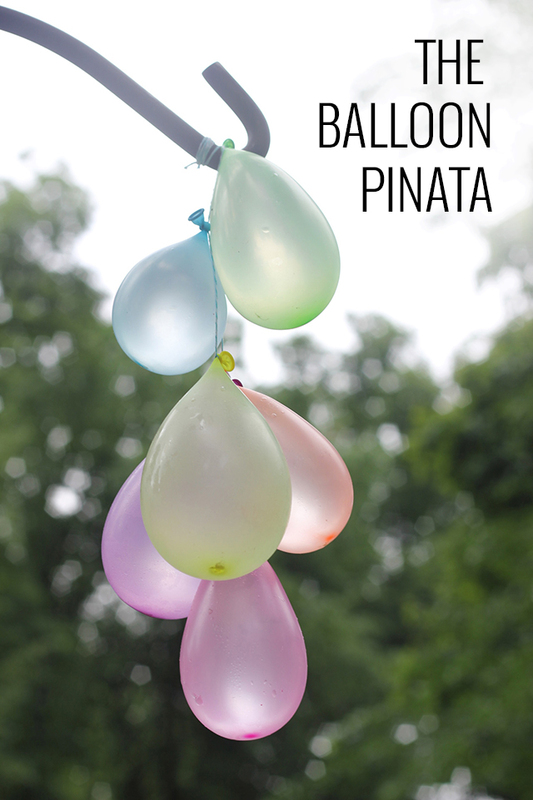 This is our favorite - a combination of balloon pinata with a hint of a dunk tank. Caution on this one. Be sure you have gentle participants with good aim so that they do not hit one another with the bats, but only hit the water balloons. Everyone takes a turn sitting under the pinata. The batter keeps his/her eyes open and tries to break the pinata in as few hits as possible to get his/her sibling as wet as he/she can while remaining dry themselves. Summer is the perfect time to burst open water balloons - even if it's just to throw them right at someone who needs to get soaked! Join us for Endless Summer Projects next Wednesday to get you ready to celebrate the 4th!